Whether you regard me as a crazy chicken lady (CCL) or merely a chicken keeper (CK), I am now certified by the City of Cedar Rapids to do what I’m doing. 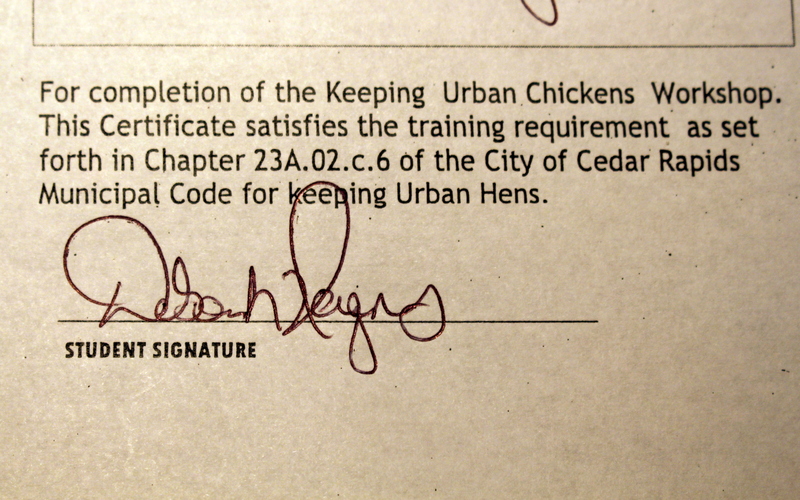 I’ve completed a city-approved training course on raising backyard chickens, and I have a certificate to prove it. While my certificate may not entitle me to list a string of initials after my name, it does qualify me to keep chickens within the city limits of Cedar Rapids. Specifically, I have satisfied the backyard chicken training requirement set out in the city’s urban chicken ordinance. And I have something new to hang on the wall. Cedar Rapids, Iowa, was one of the first cities to adopt a training requirement for backyard chicken keepers as part of its urban chicken ordinance. To qualify for a backyard chicken permit (along with paying a $25 fee and providing notice to neighbors), prospective chicken keepers in Cedar Rapids must complete a city-approved course on raising chickens in an urban setting. (a) Permit Required. No person shall raise, harbor or keep chickens within the City of Cedar Rapids without a valid permit obtained from the Permitting Officer under the provisions of this Chapter. 6. The applicant has successfully completed an approved class in raising chickens in an urban setting. The Permitting Officer shall maintain a current list of such approved classes. Since it took effect In August 2010, the Cedar Rapids ordinance has served as a model for other communities. Many Eastern Iowa towns have added training requirements to their urban chicken ordinances (and have piggybacked onto Cedar Rapids’ approved backyard chicken course). Communities across the United States – from Edgewood, PA, to Winter Garden, FL – are following suit and developing their own backyard chicken training requirements. So what does it take to satisfy a backyard chicken training requirement? How difficult is it? I took the Cedar Rapids class to find out. As far as permitting requirements go, I found the Cedar Rapids backyard chicken training to be far less painless than, say, renewing a driver’s license. 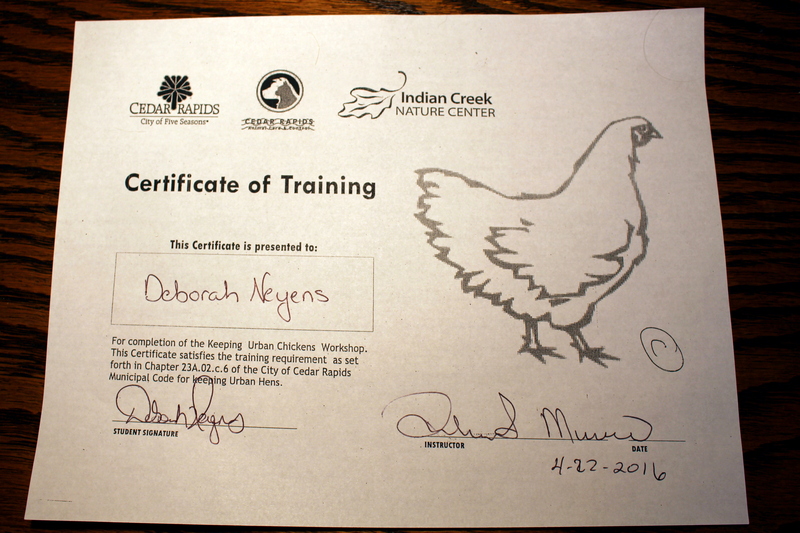 The approved course, Basic Chicken Keeping, is offered on a monthly basis at the Indian Creek Nature Center in southeast Cedar Rapids – an infinitely more pleasant venue than the DMV. Classes are held at convenient times on Friday evenings or Saturday mornings, and advance registration is available online. On the Friday evening that I attended the class, there were about two dozen participants from Cedar Rapids and outlying areas. Some were couples, some were families with children. The couple sitting next to me told me they planned to go straight from class to Theisen’s to pick up their baby chicks. The instructor of Basic Chicken Keeping was Rebecca Mumaw, the woman who spearheaded the urban chicken legalization effort in Cedar Rapids in 2010. You can read about Mumaw and her organization, Citizens for the Legalization of Urban Chickens (CLUC), in my earlier post, Is it Legal to Raise Chickens in My Suburban Backyard? Mumaw began the class by sharing a few fun facts about chickens. (Did you know chickens’ closest relative is the T-Rex dinosaur and that humans have been living with chickens for over 7,000 years?) She then provided an overview of the benefits of keeping backyard chickens, many of the same points I covered in my prior post, Five Reasons to Raise Backyard Chickens. Mumaw spent much of the class, which ran just over an hour, debunking backyard chicken myths. No, backyard chickens are not noisy or smelly or difficult to feed. As she set the record straight, Mumaw wove in valuable tips on coop requirements, backyard biosecurity, and good breeds for backyard flocks, as well as basic information on chicken care and feeding. I can’t say that I learned anything in the class that I didn’t already know, but I’ve been raising chickens for over four years now. For the novices in attendance, the class made an excellent introduction to basic backyard chicken-keeping. It also provided a good opportunity for newbies to get their questions answered from a veteran chicken keeper. My first backyard chickens in 2012. 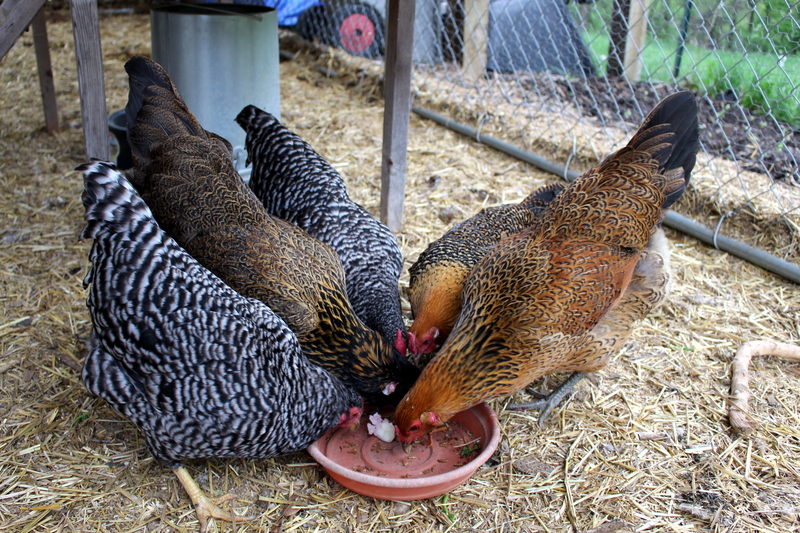 After taking the Cedar Rapids backyard chicken training, I got to wondering whether there really is such a thing as a certified backyard chicken keeper, so I took to the Internet to find out. My research uncovered the Gossamer Foundation, a nonprofit organization dedicated to global sustainability and local foods. The organization offers Backyard Chicken Keeper Certification via a 10-week online course that promises “a foundation for not only keeping and employing chickens, but understanding how, and why chickens are the enablers of local food supply and keystones to sustainable living and emergency preparedness.” Completion of course involves 30 to 40 hours of participation and passing a final exam. The current cost is $195 for individuals or $250 for families. The organization also offers Master Backyard Chicken Certification for persons who complete both the primary series and six elective courses. There are about a dozen electives to choose from, ranging from a six-class course on therapy chickens to a two-class course on processing meat birds. Prices for these courses vary but generally cost around $20 per hour of participation. The Gossamer Foundation’s backyard chicken certification courses may be of value to people who would like to be viewed as experts on raising backyard chickens. For the casual backyard chicken keeper, however, the cost and time commitment likely would be prohibitive. Fortunately, my research found no municipality that requires this certification as a prerequisite to obtaining a backyard chicken permit. In light of these considerations, it seems that Cedar Rapids’ training requirements offer a good middle ground. The Basic Chicken Keeping class is nominally priced and requires minimal time commitment. For a small fee and no more than a couple hours of their time, participants receive important information on how to care for chickens in an urban setting (and how to comply with the law). By requiring this training, the city helps alleviate concerns that backyard chickens will receive improper care and create problems for the neighbors. Significantly, according to Mumaw, Cedar Rapids has not received a single complaint about backyard chickens since the city passed its urban chicken ordinance in 2010. Can the lack of problems be attributed to the backyard chicken training requirement? Perhaps. In any event, other municipalities have taken note of the successful implementation of Cedar Rapids’ urban chicken ordinance and are copying its provisions in their own ordinances. As a result, backyard chicken training requirements may be coming soon to a city near you. What do you think? Is it appropriate for a city to include training requirements for prospective chicken keepers in an urban chicken ordinance? How far should the training requirements go? Share your thoughts in the comments section below. 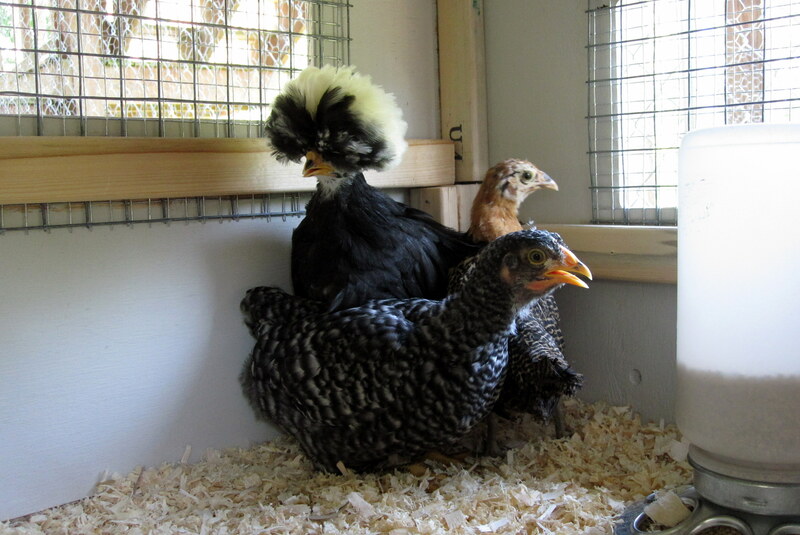 This entry was posted in Raising Chickens and tagged backyard chickens, chicken care, chicken laws, chicken ordinances, permit requirements for chickens, suburban chickens by Deborah Neyens. Bookmark the permalink.